You’ve chosen the wedding venue; you’ve debated the guest list many times…now it’s time to choose your wedding rings and that all important bridal jewellery to complement your dress on your special day! 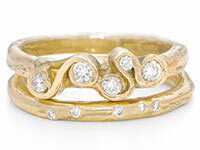 Long gone are the days when all you had to choose from was a plain yellow gold wedding band; the choices now are endless! Do not despair; for over 60 years Drakes have been helping couples to find jewellery that is perfect for them, whilst ensuring that it is a moment to enjoy and treasure forever. Choosing Wedding jewellery should be enjoyable and we do everything possible to ensure a memorable experience.When you step into one of our quiet and contemporary showrooms, you leave the hustle and bustle of everyday life behind and enter a relaxed and luxurious setting. Our friendly and experienced staff will focus solely on listening to your requirements and guide you to a piece of jewellery that is appropriate to you - with service reminiscent of another era. If it is wedding rings or engagement rings we have what your looking for. 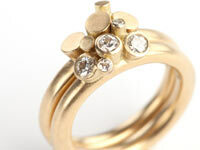 Distinctive wedding and engagement rings inspired by Cornwall, from this celebrated jewellery designer. Sparkling gemstones set in folds of gold define Emily's engagement collection whilst textures from the shoreline characterise wedding bands for the bride and groom. These are exquisite one-off creations, with an artistry to every piece. Emily’s fabulous warehouse studio in Hayle provides a special setting for a wedding consultation, you can try on pieces in the collection to take away or have a bespoke piece designed specially for you. Justin's designs evoke an elemental feel by casting precious metals in beach sand or combining them with salvaged woods. Deeply influenced by our natural surroundings, his rings are often creative, rustic twists on classic designs - ranging from sandcast eternity rings to chunky rock rings inlaid with wood. Customers are welcome to visit the workshop by appointment and be a part of the design process including using their own heirloom metal, sand or wood. Here in our Cornish studio, my small team of jewellers and I can be found hard at work creating things of beauty that our customers can treasure for the big day and years to come. We make jewellery for the whole wedding party, from cufflinks to necklaces, bracelets and rings. Most of our jewellery can be personalised, either with a message on the box or engraved onto the jewellery itself. 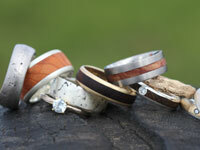 We also offer couples the opportunity to make their own wedding rings which is a wonderful experience. 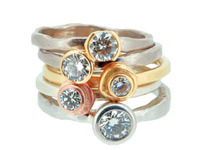 We sell jewellery through our website and notonthehighstreet.com. 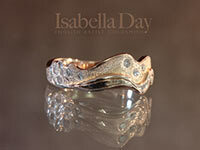 Isabella is an Artist Jeweller and Goldsmith specialising in bespoke engagement and wedding rings to fit every budget. She makes all her own gold alloys so any colour of gold is possible, even green! She also runs Make Your Own Wedding Ring days in her boutique Stable Yard studio in the stunning craft centre at Cockington Court in Devon. 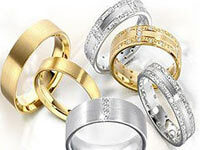 Isabella is an expert in remodelling and so you can use your inherited gold for your wedding rings. Clearly inspired by the Cornish coastline which surrounds her, Mirri Damer is a designer-maker whose jewellery is celebrated and coveted for its timeless style and low-key luxury look. Engagement and wedding rings are her most popular designs and commissions, appealing to both brides and grooms looking for a contemporary take on a timeless ring. 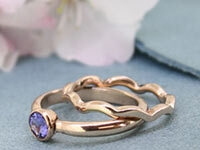 Mirri will happily re-use heirloom gemstones in her designs, bringing new life to inherited pieces of jewellery. Make an appointment to meet Mirri in her studio in Princes House, Truro to discuss any ideas you may have.